A standalone app for influencers, and also you. One thing Engage doesn't have: a timeline. Engage is for the celebrity who sees the value in tweeting, but would rather not pay attention to the broader conversation in the global town square. If reading Twitter makes you upset, but you still want to be able to broadcast the details of your latest juice cleanse, Engage may be the app for you. Engage seems to be modeled on Facebook Mentions, a two-year-old app that helps celebrities find posts that are talking about them. It differs from Engage in two significant ways. 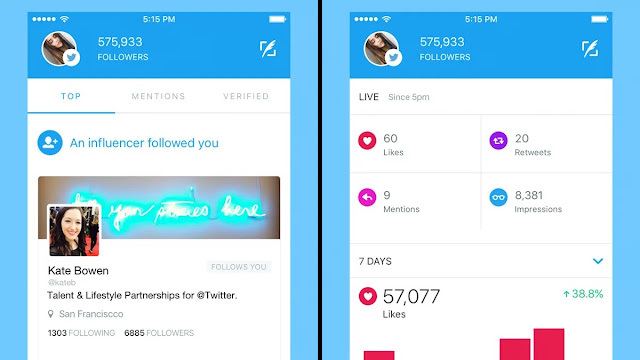 Mentions requires a verified Facebook account to use, whereas Engage will be available to all Twitter users. And while Facebook's version looks more or less like the flagship app with a special section added for monitoring mentions of your name, Engage is much more focused on analytics. What do you think of Engage? Tweet your opinion at me, and if you're famous, I'll see it. The app is now available in the App Store. As an influential celebrity on the go, you've heard about Twitter, and your handlers are always telling you about what it can do for your brand. But what are you supposed to tweet about? And what happens if a normal tweets at you? Enter Engage, a new standalone app for influential Twitter users that takes some of the guesswork out of Twitter. The app, which is available today on iOS, is designed to help famous people interact with their fans and build a bigger following. The app includes three main tabs. Engage highlights the most important interactions you've had on Twitter, and includes mentions from users who are verified, followed by a lot of your followers, or interact with you a lot. An "understand" tab shows you high-level analytics for your posts, showing you how many impressions you're getting over time. And the "posts" tab shows you detailed performance numbers for individual posts.